The Punnett Squares used on this page are not strictly correct. Throughout, the letter "g" has been used to represent the off-state for any particular colour trait. This makes it easier to scan each Punnett Square quickly and also makes it easier for novices to learn genetics. Note that capital letters are employed to represent the on-state for dominant traits [ie., BV, B, W, W*] while lowercase letters represent recessive traits [ie., c, e, s, v] in the on-state. Technically, lowercase letters should be used for dominant traits in the off-state [ie., bv, b, w, w*] while capital letters would be used for the off-state of recessive alleles [ie., C, E, S, V] . Not only can this be confusing for genetics novices but the low screen resolution typically used to view web pages makes it difficult to visually distinguish between upper- and lowercases of such letters as C, S, V, W* & W.
The above Punnett Squares are based on Mendelian genetic models. However, in actual matings, the assortment of alleles to gametes is statistical in nature. Thus, actual outcomes can vary from predicted results. Even though Wilson Whites and White Mosaics [including Silvers] are usually modelled as genotypically "equivalent", separate entries have been created mainly because the White Mosaics have a very high tendency to begat more White Mosaics rather than revert back to pure Wilson Whites. The alleles associated with White Mosaics have been flagged with an asterisk [ie., W* ] to indicate this phenomenon. The term "Carrier" is typically employed to refer to a Chin colour DiHybrid in which a Recessive Trait such as Charcoal, Sapphire, or Violet exists in the heterozygous state and therefore is NOT expressed [that is, it is invisible]. This convention does not work well with hetero Ebony DiHybrids because even in the heterozygous state, the Ebony Trait, a Cumulative Recessive or weakly dominant trait, is still expressed. The term "Cross" is typically employed to refer to a Chin colour DiHybrid involving Dominant Traits or when a Recessive Trait such as Charcoal, Sapphire, or Violet exists in the homozygous state and therefore is expressed [that is, "visible"]. This convention is applicable to homo Ebony DiHybrids but still leaves hetero Ebony DiHybrids in limbo. Accordingly, these two Ebony states are better referred to in the Chin Colour Crosses as simply "homo Ebony" and "hetero Ebony", respectively. The file size of each of the Chin Colour Crosses pages is already quite large with just a listing of Monohybrid and DiHybrid crosses with another MonoHybrid. Therefore, TriHybrids and higher have not been included at this time. The Chin Colour Crosses were designed with a screen resolution of 800 x 600 [with large fonts] in mind. However, this was not entirely successful so a screen resolution of 1024 x 768 may be more appropriate to eliminate line wrapping. The Chin Colour Crosses have been successfully tested with both Netscape 4.7 and MS Internet Explorer 4. 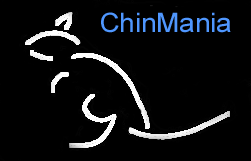 � 1999-2007 ChinMania & AniMania The concept, design, and all content of ChinMania, Chin Colour Crosses, the Chin Owners Directory as well as the terms "ChinMania", "Chinmania", "chinmania", "Chin Mania", "Chin mania", "chin mania", "ChinManiac", "Chinmaniac", "chinmaniac", "Chin Maniac", "Chin maniac", "chin maniac", and any derivations thereof, is copyrighted by ChinMania and AniMania ( � 1999-2007 ChinMania & AniMania ) and may not be used without the express written permission of ChinMania and AniMania.